Ultrabooks need to be cheaper to become mainstream. Realising this, HP has introduced the 'sleekbooks'. And this has meant cutting some corners. The HP Envy 4 Sleekbook has a 14-inch screen and stunning looks. But despite the wide frame, this one maintains its body at 19.8 mm thickness with a weight of 1.75 kg. The HD Brightview display at 1366x768p could have been better. Good sound docks have always been an iOS domain. But finally, we are seeing manufacturers turn their attention to Android devices too. 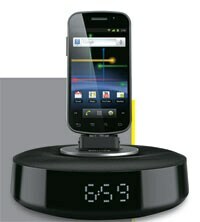 The Philips Fidelio is among the first Android docks to hit India. It has a circular plastic body with an LED display that also doubles as a clock. Perhaps to cater to all the different phones available in the market, Philips has kept the micro-USB connector flexible. The Fidelio is a Bluetooth wireless streaming music device and only charges the phone that is docked on it. Music can only be streamed over Bluetooth, that too with the help of the 7MB Philips Fidelio App available at the Google Play Store. The audio quality is good, though we felt the bass lacked strength. So do not plan a party around this dock.